The School of the Humanities and Social Sciences includes a wide range of disciplines Economics, Psychology, Management, Commerce and English. The school offers doctoral programs in these disciplines. The school runs Masters Program in Psychology, Economics and is also offering PG diploma in Clinical and Counseling Psychology. The faculty of school is offering courses in Humanities and Social Sciences to undergraduate and post graduate students of the Institute. These courses are aimed at developing students to become effective business managers in their careers besides inculcating in them an understanding of values, culture and heritage. 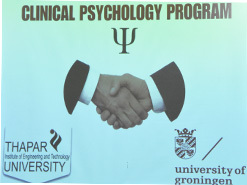 The School has MOU with the University of Groningen, The Netherlands for Clinical Psychology Program. Framework for Enhancing Technology Adoption and Management Strategies for Women Entrepreneurs in Food and Beverage Sector: ICSSR. Psychological determinants of Financial decision making using prospect theory approach: ICSSR. A Strategic Framework for Emerging Retail Formats: UGC. A Strategic Model for Enhancing Entrepreneurial Skill Development: An Empirical Study of Technical Business Incubators In India. International Conference on Role and Relevance of Ethics, Innovation and IPRs in Changing Business Scenario: 16th-17th December, 2016.
International Conference on Changing Perspectives and Paradigms of Business and Behavioral Sciences: March 28-29 2014. Workshop on Cognitive Behavior Therapy in collaboration with Clinical Psychology faculty of University of Groningen Netherlands, 12-24 Feb 2018. Workshop on Cognitive Behavior Therapy in partnership with Clinical Psychology faculty of University of Groningen Netherlands: 23-27 Jan 2017. Workshop on Research Methodology using SPSS: March 28-29, 2015. TEQIP Sponsored Seminar on Role and relevance of Ethics and Intellectual Property Rights in Changing Business Environment: September 24, 2013. 2018 Emerald Literati Award: Urvashi Tandon, Ravi Kiran & Ash N. Sah for Analyzing customer satisfaction: users perspective towards online shopping' published in Nankai Business Review International awarded Outstanding Paper in the 2018 Emerald Literati Awards. Best paper award to Prof. Santha Kumari on Psychological determinants of Investment Decision Making: A Mediation Analysis, at Global Business and Social Sciences Research conference, 2017. Best paper award to S C Bose & Prof Ravi Kiran for paper entitled Strategic Model for Stimulating Performance of Agri-Business Incubators in India at Indira Institute of Management, Pune, 2016.